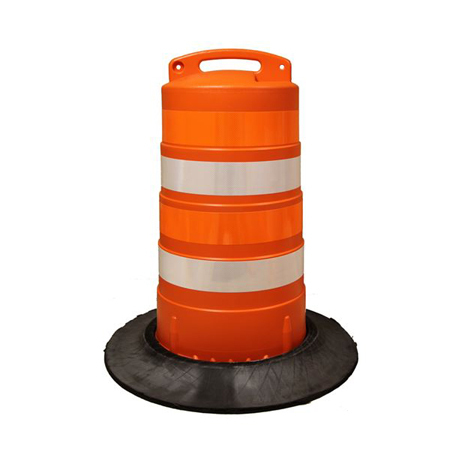 The Director™ barrel provides the service features required in a plastic drum. Molded from impact resistant polyethylene. Available in low or high density configurations. The Director™ minimizes vehicle damage and remains serviceable after numerous impacts. The Director™ barrel and base design minimize roll after vehicle impact. Various options will suit any job site requirements.The large access handle allows a worker's gloved hand to easily grasp the Director™ while handling and dragging. Our lock-tight system allows the Director™ to be moved without separations of the base and barrel.The Director™ meets or exceeds MUTCD Specification and is tested and certified to meet the requirements of NCHRP-350 Crash Worthiness. ***Weights & dimensions are nominal. Specifications are subject to change.